I’m very excited about the latest additions to my Etsy shop, Sutton Place Designs. 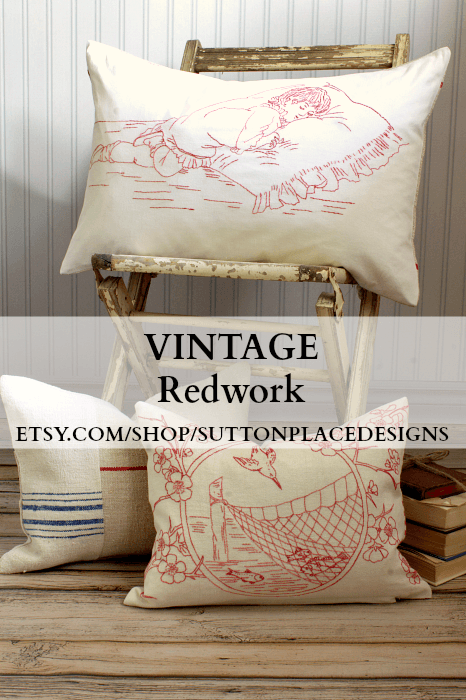 I just listed pillow covers made from vintage redwork and blue ticking. 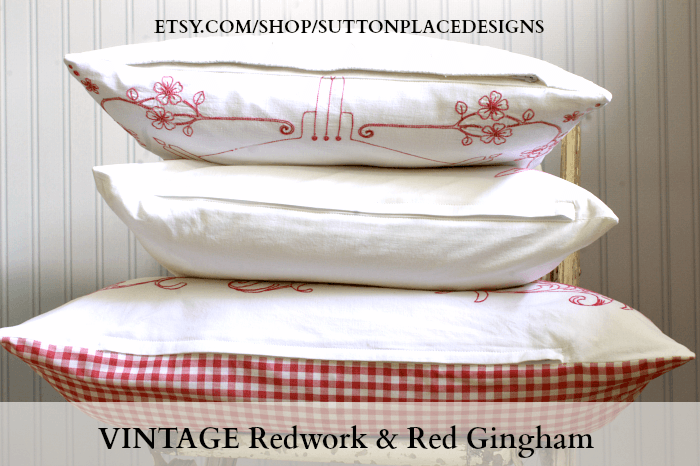 Vintage redwork is quickly becoming one of my favorite antique linens. The name Redwork comes from the red cotton thread that was used to create this style of embroidery. Redwork is believed to have originated in Europe in the 1800’s and came to America before the Civil War. Redwork was a favorite of immigrants and the middle class, because of it’s simplicity and the availability of the red cotton thread. Pieces of Redwork are hard to come by now. Many times smaller pieces, called Penny Squares, can be found but it’s hard to repurpose them into anything useful. Most pieces I find are either tablecloths or table scarves. Occasionally I find old fashioned pillow shams which were made to simply lie over the pillows on a bed. I combined some of the Redwork with vintage red gingham. I found a very large curtain panel that was faded and wonderful. Sometimes I see pieces of vintage linen and have a hard time deciding if they are worth buying or not. When I picked up this curtain panel, there was no doubt in my mind. After laundering, it became even softer and I was able to brighten the color just a bit. 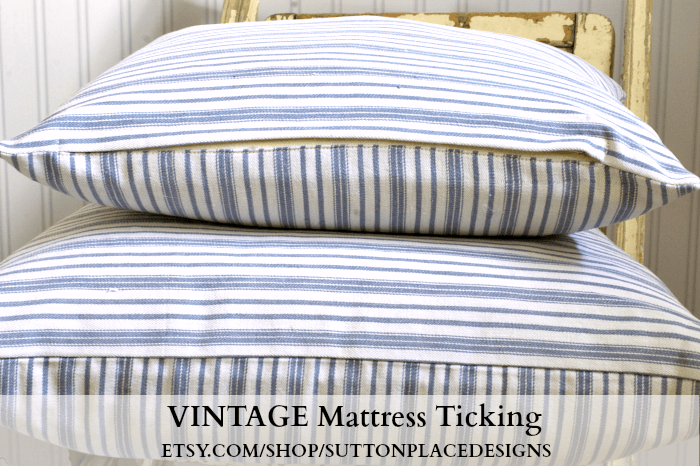 Not long ago I happened across a full sized, vintage ticking mattress cover. I was at my antique mall and nearly fainted when I realized what I had found. I was disappointed to find that it had a large tear on one side and several very dark stains. I decided to purchase it anyway and see what I could come up with. After washing it twice and cutting around all the stains, I was able to come up with just 5 pieces. I put them in a shop section of their own called Vintage Blue Ticking. The Redwork and Blue Ticking pieces are very limited. What is listed is truly what is available. I do have some pieces of the ticking cut out to make lavender sachets. Hopefully I will get to that this week. For my fellow vintage linen lovers, I am offering a 15% shop discount just for one day. Use the code VINTAGE15 when you check out. (All caps, no spaces.) Code will expire at midnight on September 9, 2013. I’ll be back tomorrow evening with Fall Mantel inspiration. See you then…thank you for stopping by! Well Ann…..As usual, you’ve come up with more exciting ideas. 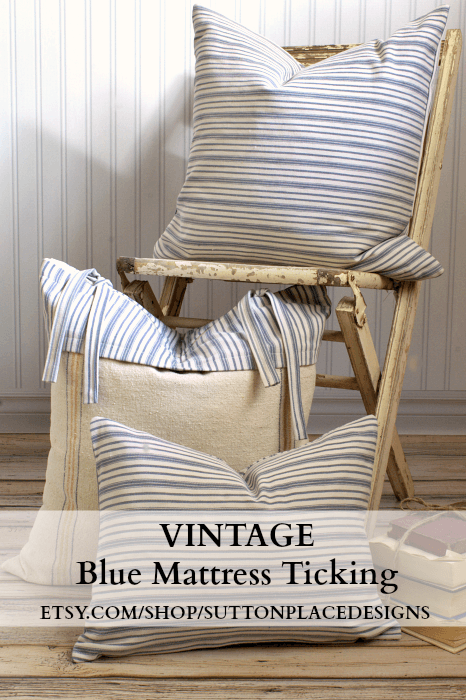 Love the redwork, and of course, blue and white ticking is one of my favorite fabrics to have in my house. Oh Ann, so beautiful. I can’t wait to get our house going and coming to your shop to shop!!! Looking forward to it. You are a talent. The crisp clean look of Rework is what draws me to it. Having made several large piece, I am hooked. Your etsy page is looking good for the holidays!!! Thank you for the wonderful ideas! I just found a container of vintage linens that I forgot I saved that were my grandmother’s. I am in HEAVEN now as I think pillow covers will be a perfect use for the towels. Now I cannot wait to get home and dig in them. Thank you so much! Oh my word Ann. So beautiful. I’ve loved redwork forever & the blue ticking is so gorgeous. Oh I wish I could take a pillow sewing class from you. I mean, I can sew and I make pillows – but they just don’t look like yours! I think you’ve got the magic touch!! Oh those are just gorgeous Ann! Hi Ann! oh, these pillows are gorgeous! I love red work and have done some. I love those first pillows! That ticking stripe is divine!! I can’t find ticking stripe fabric anywhere near where I live… what a drag!!! Gorgeous Ann…I love them all!! Your new items are gorgeous Ann! I’m sure they will sell quickly. Pinning them right now! I have always loved vintage redwork, and you have some wonderful specimens here, Ann! Love your new blog I discovered..cute things, fun recipes..kinda old fashioned in a modern way..since I am getting up there after retirement..have lots of time to read Blogs..anxious to try the peach cobbler..love the ticking and redwork. 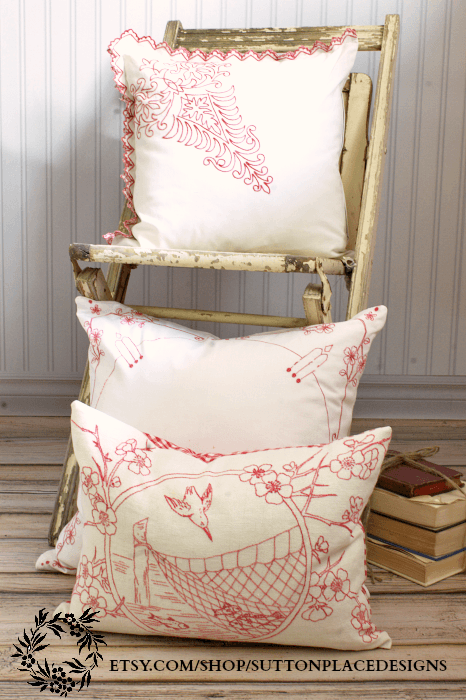 The pillows you made out of the redwork are beautiful. My mom used an old pattern to stitch a bed covering in redwork, so it was interesting seeing the pieces you found to make into pillows. Beautiful ideas you have…I am new to all of this and have no idea what a etsy shop is???? Oh my goodness. Let me introduce to Etsy! Sellers are limited to listing items that are handmade or vintage…however, Etsy has relaxed those rules and have included a category called supplies. I was not in favor of that but they didn’t listen to me! You should just go and look around. You will be amazed. So lovely Ann! I love them all :) Your work is just outstanding too! Oh, I love those, Ann.